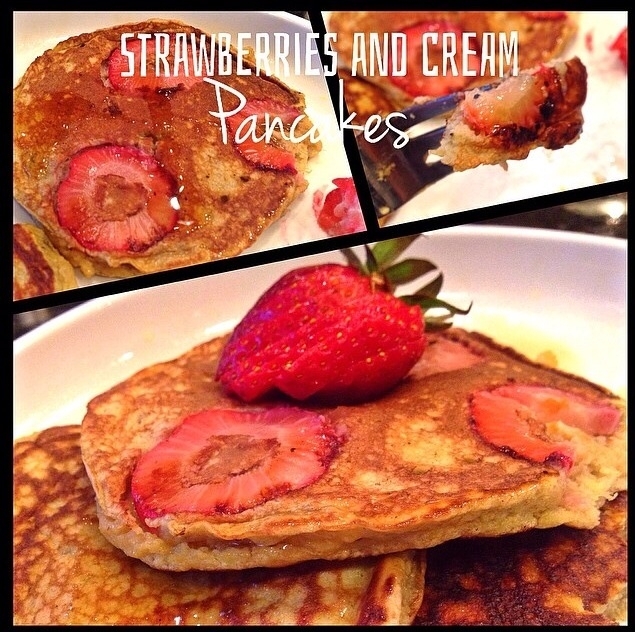 Ripped Recipes - Strawberries and Cream Swirl Pancakes. Home » Recipes » Breakfast » Strawberries and Cream Swirl Pancakes. Strawberries and Cream Swirl Pancakes. Dessert for breakfast in pancake form! Heat skillet over medium high heat. Combine all ingredients except cottage cheese and strawberries. Spray pan with non stick spray. Swirl in 1/4 c cottage cheese into batter careful not to over mix. Slice strawberries into thin disc shapes. Pour 1/3 of batter into pan and pressed sliced strawberries into batter. Flip when edges dry and bubbles form. Repeat with the remaining batter. Top with favorite nut butters and sf syrup.